Last month, Deutsche Post DHL transported six kilograms of medicine from a pharmacy in Bonn, across the Rhine River, to its headquarters. 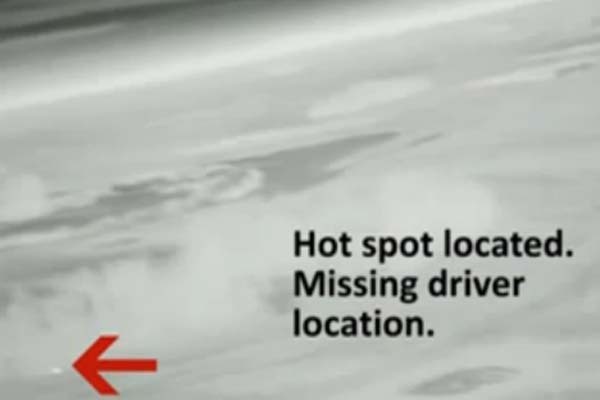 This wouldn't have made international news, except that DHL accomplished this with an unmanned aircraft system - commonly known as a drone. This came less than a week after Amazon's Jeff Bezos claimed his company would deliver products to customers' doorsteps via drone in three or four years. 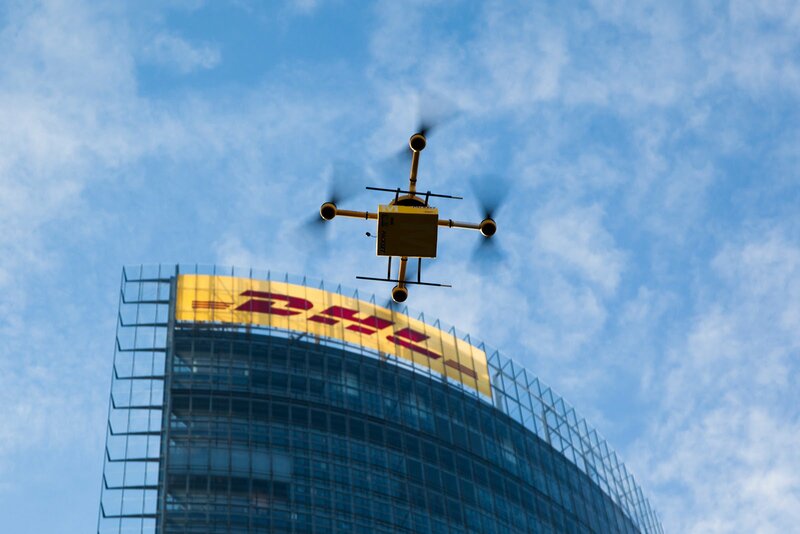 Regulations and technological hurdles would make Bezos' plan all but impossible in the US near-term, but DHL proved that with proper planning and logistics, you could deliver small parcels with small drones today. On January 22, The International Research and Exchange Board, or IREX, will be hosting a "deep dive" discussion on how this same technology could benefit international development. Recently, I was tasked with producing some basic citations on unmanned aerial vehicles, more commonly called drones, for a new grant proposal. As you could imagine, it was not hard to find a cornucopia of papers reflecting the many novel uses for the technology. What might surprise some, though, was the sheer increase in drone research, how popular these papers are in the academic world, what that research trying to accomplish, and who was funding it. An MLB Company representative shows the company's Super BAT's camera gimbal system to an audience member during the SUSB Expo, in San Francisco, CA. It's not very often you get the chance to watch the birth of a multi-billion dollar industry firsthand. But if we are to believe the Association for Unmanned Vehicles and Systems International (AUVSI) economic report, which estimates the unmanned aviation industry should reach $82 billion by 2025, that's exactly what happened at the first-ever small business expo for unmanned aircraft, the SUSB Expo, in San Francisco. 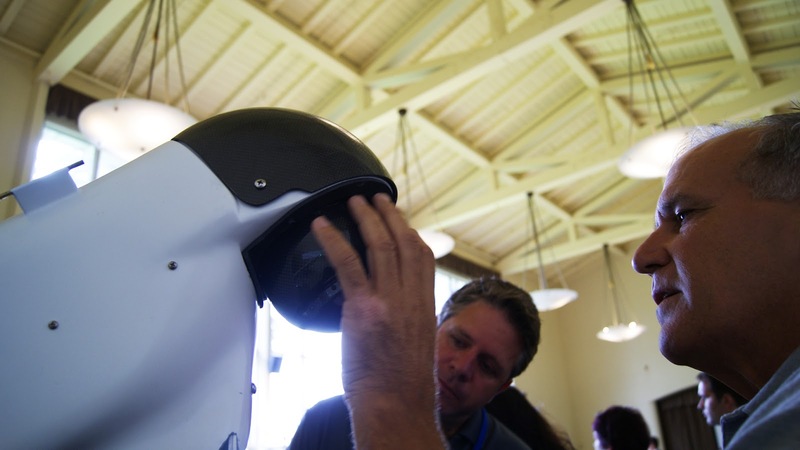 "It's like being in Steve Job's garage," said Agriflight's Bruce Parks, as reported by Robohub's Andra Keay. Ian Hannah of Avrobotics.ca displayed his professional hexcopter at the UAVs Pros Cons Symposium in Toronto. One of the biggest drone-related stories to make the rounds is about a little Colorado town that is attempting to institute a $100 reward for anyone who shoots down an unmanned aircraft. I'll not post a link to this story, or name the actual town, since it appears this is little more than a stunt to attract media attention to the town. The townspeople may or may not be "real" about their proposed law, given the likelihood of people being injured by gunfire or falling drones, but fear of unmanned aircraft systems (dronephobia?) is real. This fear is rooted in a disconnect between popular media, and the actual uses and potential for the technology. UAVs Pros-Cons was an effort bring expert knowledge to the public, while at the same time providing a discussion of many of the legitimate concerns over drones and their uses. Why the word "drone" is scaring neighbors, creating bad legislation, and blocking an economic boom. Sensationalist coverage and fabricated illustrations have cemented the word "drone" as a weapon in the public psyche. But it may not be too late to change public opinion about the technology behind the word. A few years ago, a colleague and her husband, an ex-helicopter pilot, realized a tectonic shift was disrupting industries in which they had devoted entire careers. This disruption had a passing resemblance to what happened to other American industries. The hard work once done by skilled, human hands was now being automated by the calculating actuators of a machine. 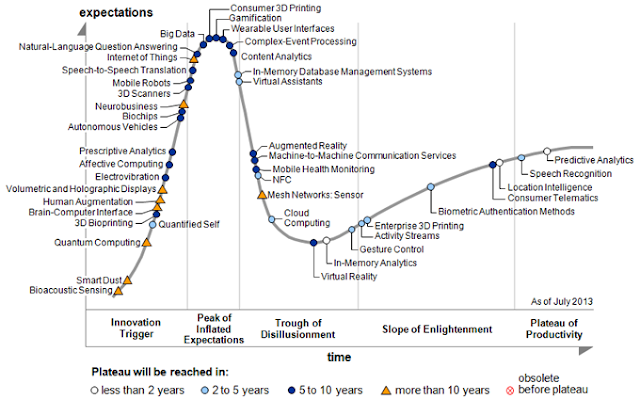 Automation had long since dominated the appliance, automotive, and electronics industries. But this was a brand new territory – aviation. The reduced price and size, and the increased reliability and capability of processors, sensors and batteries meant unmanned aviation had been unleashed. A nouveau DIY revolution meant that basements and garages were once again incubating nascent technology, just as they did in the 1970s when the personal computer was being developed. The silver lining is that the cost of search and rescue, disaster relief, monitoring wildlife, guarding endangered animals from being poached, and even medication delivery to underserved populations all could be slashed. Like many other small startups in the unmanned aviation industry, my friend and her husband saw an opportunity. And despite criticism of slow progress on regulations, the Federal Aviation Administration also sees it. The FAA estimates that the market for commercial unmanned aerial systems will eventually reach $90 billion. The Association for Unmanned Vehicles and Systems International (AUVSI) believes there will be an economic impact of $13.6 billion within 3 years that unmanned aircraft are integrated into the national airspace. Where to start? What better way to get acquainted to the industry than attend one of the premier industry conference in the nation, hosted by AUVSI? She learned about new applications for unmanned aircraft. She listened to a UAV operator who used his homemade robotic aircraft to assess flood damage in Thailand. The information gathered from the aerial vehicle allowed the government to make decisions that mitigated flooding in the country’s capital. Search and rescue often is touted as one of the areas where unmanned aircraft, commonly called drones, can do the most good with existing technology. SAR, as it's called in the business, will only make up a small part of the economic pie for the unmanned aircraft industry, according to an economic report by the Association for Unmanned Vehicle Systems International (AUVSI). But out of all of the potential applications, due to the personal impact and high news visibility of missing persons, it has the potential to be the greatest asset in public acceptance of drones. If a positive public perception translates into acceptance, history might show that Thursday was a game-changer in terms of domestic drone adoption. 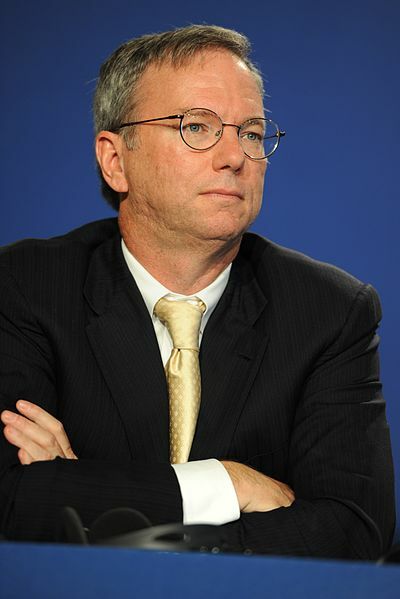 Why Google's executive chairman is totally wrong about "drones"
In a interview published in the Guardian newspaper on Saturday, Google Executive Chairman Eric Schmidt called for tough regulations on unmanned aircraft systems, commonly called drones. "How would you feel if your neighbour went over and bought a commercial observation drone that they can launch from their backyard. It just flies over your house all day. How would you feel about it?" On engaging the public on privacy, journalism, and drones. Journalists might be familiar with the quote by US Supreme Court Justice Louis Brandeis, who once wrote "Publicity is justly commended as a remedy for social and industrial diseases. Sunlight is said to be the best of disinfectants." Journalists seeking to use unmanned aircraft would be wise not to just apply that concept of uncovering the truth about others, but also to make the public aware of how they intend to use "drones." While the response journalists get from the public might be unexpected, the answer is not to become defensive or rely on ad-hominem arguments. Whatever your station in journalism, you are as much a servant to the public as any of the officials you interview. The following is copied from the post I wrote for sUASNews.com. Unmanned aircraft made their South By Southwest debut this year, and prominently so. A session with Chris Anderson, former Wired EIC turned full-time head of 3D Robotics, and Ryan Calo of The Center for Internet and Society at Stanford Law School, among others, included a discussion on the many commercial uses for UA. On the same day, at the Palmer Events Center, near a full-scale replica of NASA's James Web Space Telescope, another panel was being held that featured a live demonstration of an unmanned system. 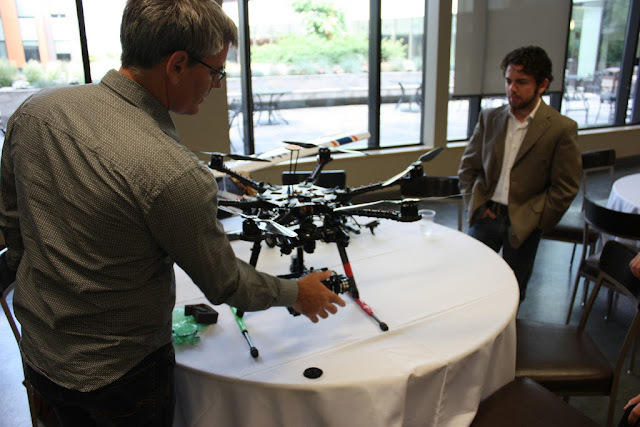 Since it was introduced in 2010, the AR.Drone has been a success among hobbyists, hackers, engineering students, drone journalists, activists, and aspiring UAS (Unmanned Aerial Systems) operators. Produced by the French wireless products manufacturer Parrot, this camera-enabled quadrotor can be controlled over WiFi via iOS or Android-enabled phones and tablets. This has been the go-to item for many news organizations trying to understand the new world of UAS without a tremendous investment. The Sydney Herald recently used one to help bring context to their story about privacy concerns amidst the proliferation of "drones." A news crew in Florida also tried using an AR.Drone to get a better view of a live event, but they were chased out of the sky by angry bees. Since launch, it has sold over 300,000 units. That's ten times the number of UAS that the FAA anticipated would by flying in American airspace... by 2020. 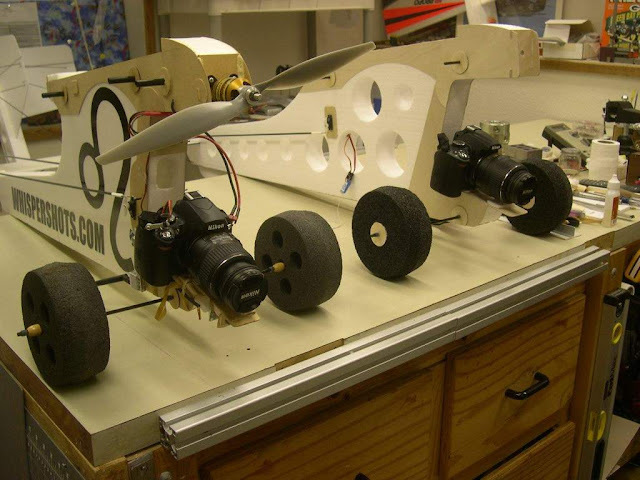 A selling point of the RC aircraft from the beginning has been augmented reality dogfights with other AR.Drones, facilitated by on-board image recognition. 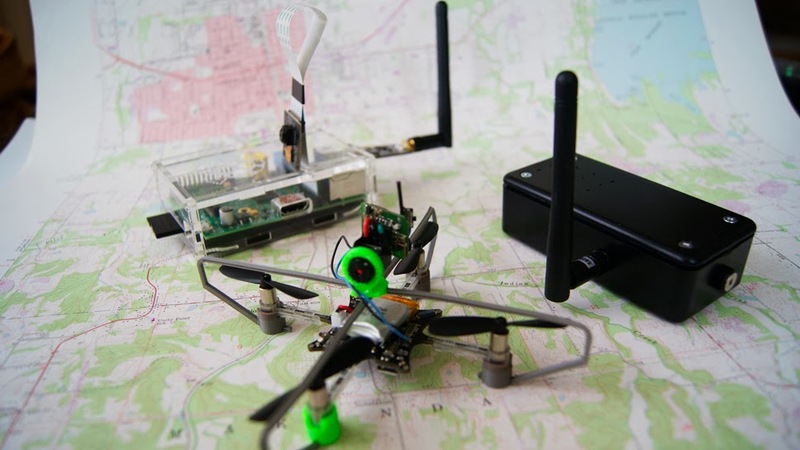 Parrot recently unveiled another addition to the drone's list of AR abilities -- a GPS receiver. UPDATED X5 I'll give you $380 if you make your drone useful during winter storm Nemo. 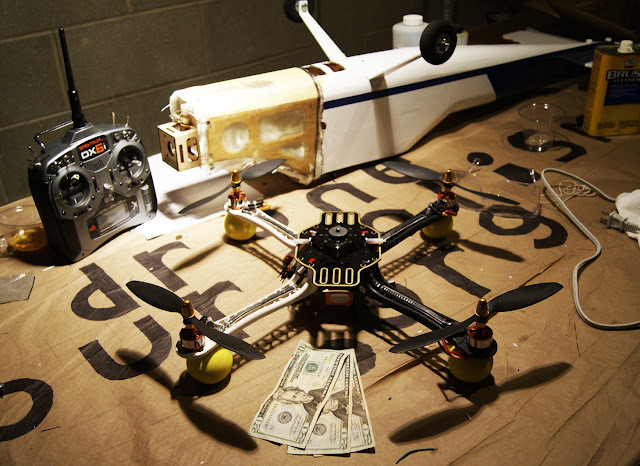 Above is a picture of a quadrotor drone, an airframe from a fixed-wing drone, and $60 $120 $220 $280 $340 $360 $380 cash. The money is yours if you make your drone useful during the aftermath of winter storm Nemo. I know it's not a lot of money. It's all I can afford right now. Several generous and forward-thinking folks in the drone community have made this prize possible. We'll mail the prize money to you if you complete a task that demonstrates how useful drones can be in the event of a natural disaster. Why? Because I believe that drones can be used for good. That's why I started DroneJournalism.org and co-founded Drones for Good. The North East is having a weather crisis. Some call it "Nemo." Governors in four states have ordered citizens not to use public roads. Airports are closing, and public transit is closing down in New York, Connecticut, Rhode Island, and Massachusetts. Feet of snow are supposed to fall, making it difficult for emergency crews to respond to the disaster. You know what could help during a time like this? A drone. In a world of smart things like smart lights, smart toilets, smart grids, smart meters, smart roads, and the like, what happens when you have "smart people" (i.e. put sensors on people)? What do we make of the growing numbers of businesses like department stores and restaurants that prohibit cameras, yet display QR codes that require cameras to read and understand? It's not just about surveillance, either. Surveillance has a specific meaning, which refers to observing people or objects from an elevated position.That means surveillance is conducted by law enforcements and governments. Sousveillance, on the other hand, means observing or recording from below. When average citizens, as opposed to the government, do the recording, that's sousveillance. How about droneveillance? Unlike fixed cameras, drones are highly mobile platforms for a variety of remote sensing devices. They're agile, relatively silent (depending on the altitude), and can even fly indoors. They've gotten especially smart at negotiating obstacles and mapping unfamiliar terrain, and they can work as a team to provide comprehensive monitoring. Progress in covering large events with aerial drones, especially protests, has been led almost exclusively by political activists. The most recent effort by activists to use drones document the scale of anti-government demonstrations comes from Argentina, where the “8N” demonstration on Thursday, November 8. That day, some 30,000 Argentinians protested economic conditions, government corruption and the fear that President Cristina Fernandez will attempt to end her term limit. According to the group El Cipayo Argentino, the government had closed down the airspace ahead of the protest, and did not allow news helicopters to cover the event. 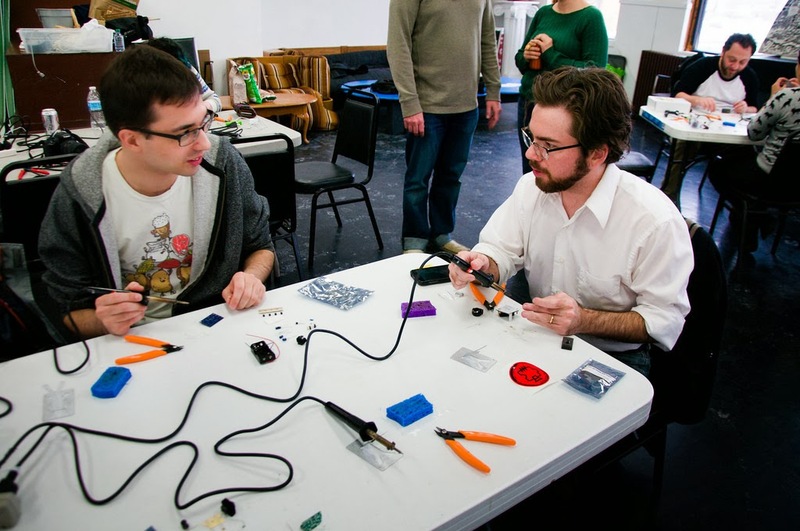 So the group came up with a low-budget workaround: they built their own aerial drone to provide coverage from the sky. As you can hear from the video, the camera attached to the drone picked up a great deal of propeller and motor noise. The fact that protestors can be heard above the din of the whirring motors speaks volumes. Al Jazeera has a write up about the protest and the activists behind the drone here. We need more drones because we’re having more big disasters. The images of an inundated New York City certainly were eye-catching. But it isn’t until you start parsing the data that you start to really understand how bad things got for the East Coast. Some of the most startling stats: winds pegged at 90 miles an hour when Sandy made landfall as a tropical storm. It left 185 dead between Jamaica and its terminus in the US. It was the second costliest hurricane in recorded history after Katrina, with $52.4 billion in damages. Five thousand commercial airline flights cancelled. Across 26 states, up to 80 million were affected. Eight and a half million people without power after the storm. Even 11 days after the storm, with freezing winter temperatures closing in, 428,000 in New York and New Jersey remain without power. Aon Benfield, an insurance broker that specializes in catastrophe management, crunched the numbers and found something just as remarkable about hurricane/tropical storm Sandy. Well, perhaps not so much about the storm itself, but how it fits into recent weather events and climate change in general. Meanwhile, climate scientists noted that not only did global warming make such a historic slew of storms possible, it also made the sea level rise, thus increasing the damage to coastal areas. When Thailand was flooded in 2011, the government contracted a drone to scout out where flooding had occurred, which helped make decisions about where and when to release flood gates. The contractor flew more than 60 flights over a period of 45 days, and claimed that the data obtained from those flights helped prevent the city of Bangkok from suffering more during that catastrophe. 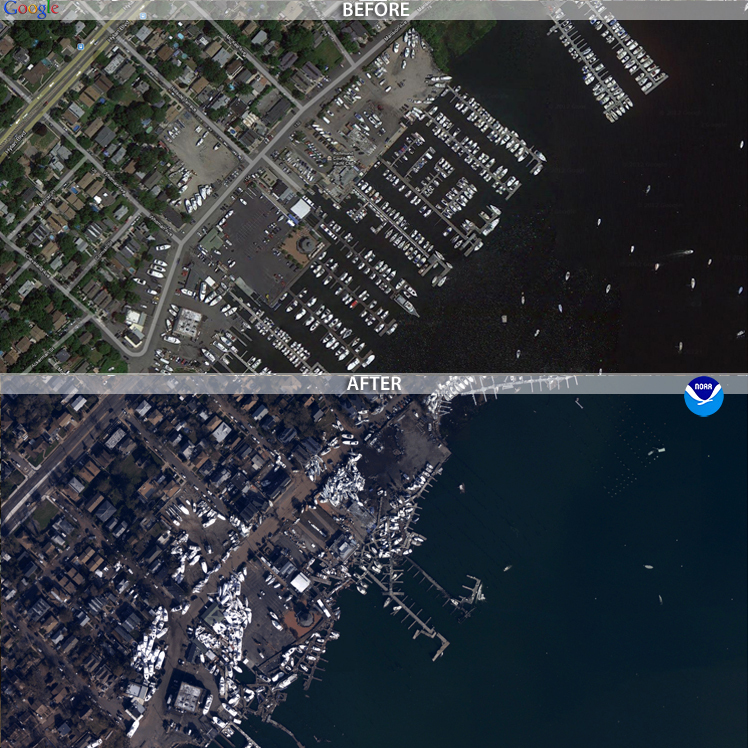 “Irene was child's play in comparison to Superstorm Sandy. In fact, there was no real damage from Irene,” Brodie wrote. The public wasn’t able to obtain coverage from drones for Sandy. Some news sites did, however, post before and after photos of New York and New Jersey. These post-sandy aerial photos were obtained by the National Geodetic Survey, with the help of NOAA’s King Air and Twin Otter remote-sensing aircraft. The photos were set side-by-side with historic satellite imagery, allowing users to drag these images to do their own comparisons. 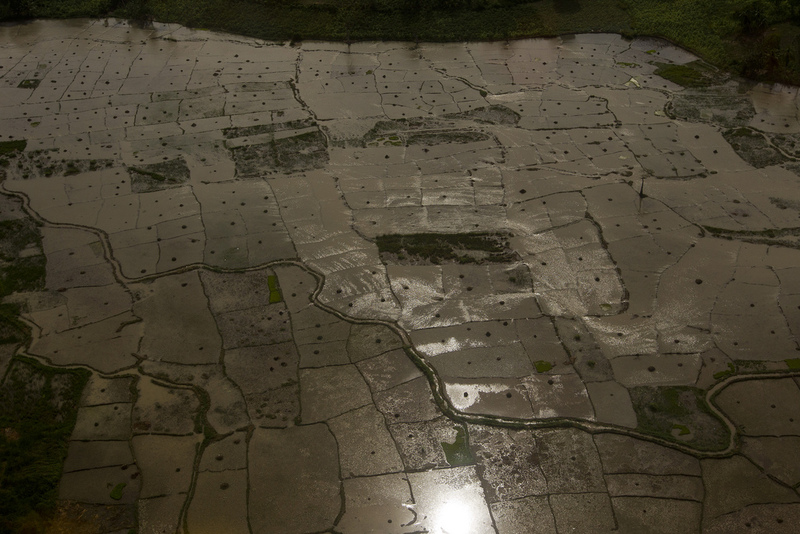 Because of the prohibitive cost of aerial photomapping, these images were gathered by government agencies. But, if FAA regulations allowed it, the job could have easily been done with a $1,000 aerial drone. That puts it within reach of even independent and backpack journalists. Or concerned members of the community. If the climate models hold true, there’s going to be more “superstorms” like Sandy every year. There will be more billion-dollar disasters, more lives lost, more power outages, and the public will need more information about how those disasters are affecting their communities. Drones are especially capable of giving quick data on the scope, or extent, of large-scale disasters. Now is the time for journalists to learn and perfect tools like the drone to give the public that information. Photo at the top of the post is of post-Sandy flooding in Haiti, via the Flikr photostream of United Nations Stabilization Mission In Haiti.